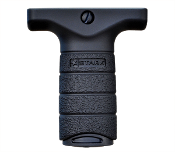 The Stark Compact Forward Grip is a streamlined design of our full sized grip for those with a need for a lower profile fore grip. This light weight grip allows the shooter to grip the fore endin a variey of hand positions without added weight or bulk on the hand guard. Can be used as a hand stop while gripping the hand guard or simply as an indexing point. We've added more textured surface to the lower end for a reliable grip and retained a small storage space inside.